Though neither the creator of this strip nor the protagonist is Jewish–as far as we know–Gene Carr’s Mr. Al Most provides textbook examples of a couple of Yiddish archetypes. One is “mensch”, as he’s truly a great guy; he’s selfless in his desire to help his fellow man, with no regard to his personal safety or comfort. He’s the model that all of us should aspire to in our daily lives. Unfortunately, the other word that suits him to a “T” is “schlimazel”. To many of us, “schlemiel” and “schlimazel” are just words that Laverne and Shirley intoned in the introduction to their show’s theme song, but their meaning is illustrated wonderfully in a classic bit of Yiddish explication: a schlemiel is the kind of guy who spills soup on a fellow’s lap, while a schlimazel is the fellow who gets it dumped upon him. Poor Al: he always tries–and succeeds!–to do the right thing, but he’s always put upon for his efforts; left bloodied, bruised, scorned, and occasionally in the cusutody of the authorities. 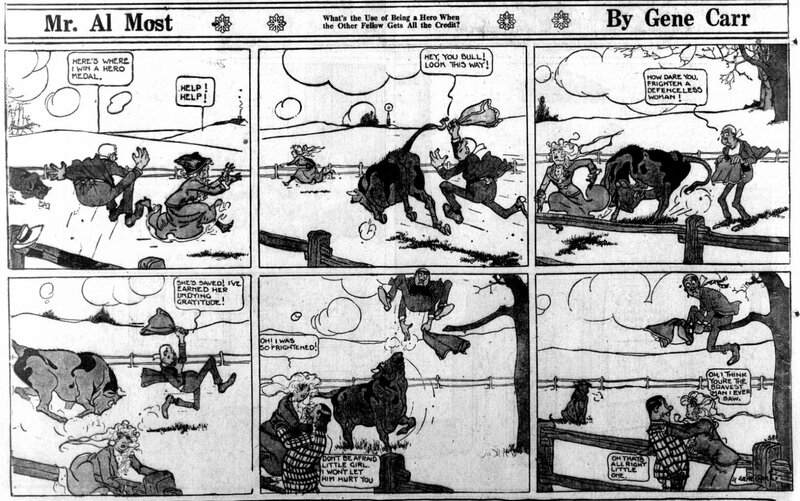 It’s a terrific formula; the strip is funny and the character is very sympathetic. For half of the run, anyway… Then the premise of the strip changes, going from a fellow who does good deeds to a fellow trying to ditch the penniless, zaftig woman to whom he’s become mistakenly engaged. You still feel kind of bad for him, but he’s kind of a heel to this poor girl as he cooks up ideas to trick her into breaking off the engagement. Though I will say that it’s a testament to his core mensch-ness that he can’t bring himself to simply skip town or let her down hard. Ah, maybe he’s still a good fellow, after all.